Denarau Island is one of the most popular islands in Fiji, which is renowned for its tranquil beaches, lush rainforests and wide variety of luxury and affordable hotels and resorts. The island is not only engulfed by palm fringed beaches, but also incorporates a variety of fun and exciting holiday attractions, activities and entertainment including cultural temples, a professional 18 hole golf course and variety of water sports including parasailing, scuba diving trips, cruises, fishing trips and jet boat rides. The central point in the island is Port Denarau, replete with cafes, restaurants and a new shopping centre, all set against the backdrop of the spectacular marina, where cruises and deep sea fishing trips embark. Denarau Island is a tropical island that is connected to the main Fijian island of Viti Levu via a causeway, making is very easy to access. It is located only 20 minutes away from the Nadi International Airport by car. Getting around Denarau Island is also easy with the Free Bula Bus that goes from resort to resort on the Island and then to Denarau Port. You can click here to see all Denarau Island Rates & Availability. The luxury Fiji Beach Resort is perfectly positioned on Denarau Island overlooking the tranquil waters of the Mamanuca Islands. At the Fiji Beach Resort & Spa there are 7 pools surrounding the delightful Nuku restaurant, a world class golf course, tennis courts and a range of other leisure activities and water sports. With spacious villa accommodation and 1½ kms of beach front to relax on the Fiji Beach Resort on Denarau Island is the perfect place for an escape to paradise. 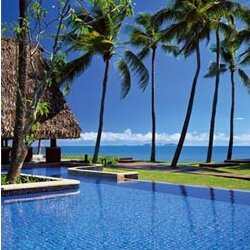 The Sheraton Denarau Villas is one of the most exclusive beachfront resorts in Fiji. This Denarau Island resort accommodation consists of luxuriously appointed 1, 2 and 3 bedroom villas that have everything that you need to a truly memorable holiday. Situated right on the waterfront the Sheraton Denarau Resort has an infinity style swimming pool, tropical garden, spa, restaurants, bars, relaxing beaches, 18 hole resort golf course and an array of recreational facilities, making it ideal for a family holiday or romantic getaway. The Sheraton Fiji Resort on Denarau Island is an inviting place the exudes a familiar kind of comfort. Te resort's lagoon style swimming pool is a great place to relax and meet people, whilst the array of restaurants and bars at the Sheraton Fiji Resort provides magnificent local and international cruisine as well as themed buffet dinners. This Denarau Island Resort has a whole raft of entertainment and leisure activities that guests can enjoy, all set in one of the most idyllic South Pacific settings that you can imagine. Each of the stylishly appointed accommodation suites at the Sofitel Fiji Resort provide wonderful views over the Pacific Ocean from its own private balcony. With a huge lagoon style swimming pool located between the pristine beach at the property the Sofitel Resort on Denarau Island offers an unforgettable holiday experience for couple or the whole family. For the adrenalin junkie there are also lots of adventure activities available at the Sofitel Resort including skydiving, jet skiing, sailing, mountain biking, sea kayaking, snorkelling, scuba diving and much more. The Westin Denarau Island Resort is ideally positioned just 20 minutes from the Nadi Airport and on the beachfront of Denarau Island. The Westin Denarau Resort & Spa seemlessly combines luxury accommodation, lush tropical surroundings and traditional Fijian warmth. This Denarau Island accommodation is unique in that it provides a genuine island feeling within a complex that still features lots of modern amenities including a two tier swimming pool, beachside Jacuzzi and excellent restaurant. The Terraces accommodation on Denarau Island provides a great location in which to relax and watch time go by. For golf enthusiasts the Denarau golf course is so close that you can actually see golfers teeing off from you apartment. Holiday makers will feel relaxed as soon as they arrive and the very affordable prices mean that the Terraces Denarau Island is ideal for both couples and families. Staying at this Denarau Island resort you will have easy access for exploring the Mamanuca Islands, or you can simply sit back and enjoy the tropical ambience around the 25 meter lap pool. If you want hotel and/or resort accommodation on Denarau Island at cheap rates for your next holiday then Holidays Fiji is the place for you. We give holiday travellers the ability to compare a range of hotels, resorts and apartments at the same time, thus making it easier for you to decide where it is that you want to stay. So book your accommodation at any of the Denarau Island resorts with confidence, and even take advantage of the cheaper rates for longer stays.